The Disc Musical Box by Kevin McElhone This is a Limited Edition book published to Celebrate 50 years of The Musical Box Society of Great Britain 496 pages, Hardback and in FULL Colour Throughout Includes a DVD containing additional illustrations and tune lists, together with scans of contemporary makers� catalogues. Chapter Headings are:- 1. 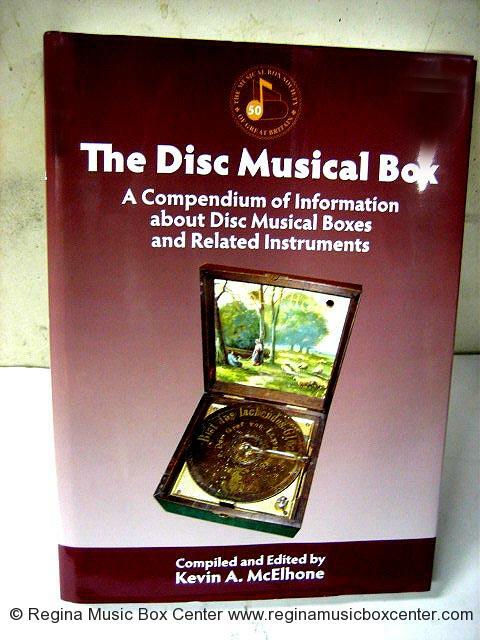 A brief Description of Disc Musical Boxes and an Overview of their History. 2. 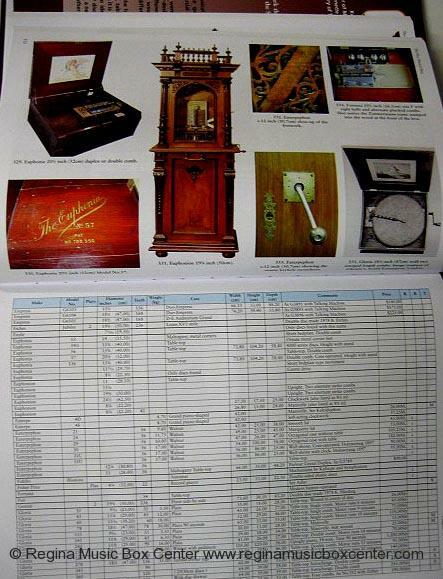 Descriptions of the Instruments �Includes Makers� Histories and ModelDescriptions. 3. Table of Models - over 1,600 found at the time of going to press. 4. Serial Numbers - of surviving instruments at the time of going to press - can you add more? 5. Tuning Scales - over 170 of those mostcommonly found. 6. Identification of Discs - over 350 differenttypes described and illustrated. 7. Tune Lists - four lists are in the book, the remainder will be found on the MBSGB Website. 8. Case Lid and Cabinet Pictures - over 400 different attractive and colourful illustrations. 9. Patents - over 650 listed,together with website addresses for further study. 10. Storage of Discs or Music Sheets Appendices 1. Original Costs and Notes on Currency Conversion. 2. Makers of New Discs, Bins, Instruments and Parts. 3. Further Reading. 4. Mechanical Music Societies. 5. Mechanical Music Museums. 6. 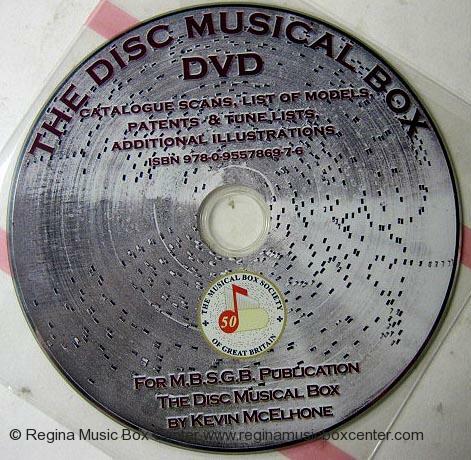 Finding and Buying a Disc Musical Box. 7. Sources used during preparation of �The Disc Musical Box�. Index of Illustrations. The DVD contains A. 466 pages of scans of original makers�catalogues. B. 211 pages of scanned makers tune lists. C. 5 tune lists; these are in PDF format and are searchable. 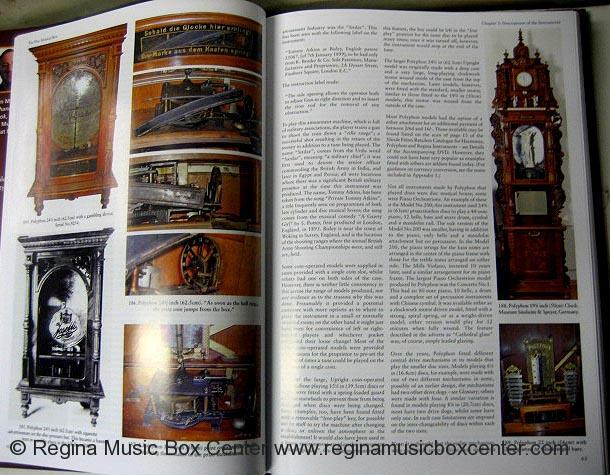 D. 1,600 Musical Box Models;the lists are in PDF format and are searchable. E. 1,100additional illustrations that would not fit in the book.